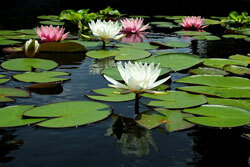 A water lily grows in a pond, doubling its size every day. After 24 days it has covered the whole pond. After how many days did it cover half the pond?